Grew up… in the small West Virginia town of Ferlin, where his brother is now a marijuana farmer. Ray had a rugged upbringing learning to shoot a bow and arrow to hunt bears. He went on to attend Marshall University where he was a cheerleader. Living… alone in an apartment totally kitted out with Japanese decorations. Profession… field agent for the bumbling espionage agency ISIS. Ray is a talented and level headed spy who is constantly hamstrung by his incompetent coworkers and selfish boss. Ray’s no boy scout, but as far as ISIS employees go, he’s one of the most professional. Interests… too many to count. Ray is a world class pilot, an Olympic bronze medalist in the giant slalom, and a skilled artist. He also harbors an intense obsession with Japanese culture, and never travels without several kimonos. Ray has also been known to spend his time in less reputable ways – namely taking ecstasy at raves. Relationship Status… single. Ray is gay, and his sexuality is frequently mocked by his coworkers. Ray doesn’t seem particularly relationship oriented but he could almost certainly find a boyfriend if he really wanted one. Challenge… surviving the idiocy of his coworkers. ISIS is the least effectual spy agency in the world. His fellow field agent Sterling Archer is unfocused, and has a tendency to shoot other ISIS employees. 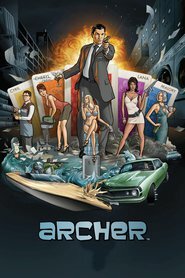 His boss, Malory Archer, is constantly using the agency to make her a personal fortune. Ray struggles to survive the endless, outlandish adventures that his coworkers pull him into. Personality… normal – at least compared to the others at ISIS, which isn’t saying much. He is friendly, and has a sense of decency that is a total mystery to most of his coworkers. While he’s nicer than just about everyone he works with, Ray is far from a saint. He’s often driven by greed and has been known to steal company funds to satisfy his many vices. He’s friendly to strangers but doesn’t extend the same privilege to the people he works with, who he often subjects to torrents of verbal abuse. Ray Gillette's popularity ranking on CharacTour is #1952 out of 5,000+ characters. See our top-ranked characters and read their profiles.